A fundamental principle of maintaining good work-life balance is finding time for recovery. After a sustained period of hard work we need to switch off and do something that moves our attention elsewhere. For me that something is yoga. I’ve been doing it for the past fifteen years. Yoga undoubtedly benefits both my physical and mental health; and in addition I’m increasingly finding that lessons I learn ‘on the mat’ can be applied to my life ‘off the mat’. Balance is dynamic. It requires moment by moment adjustments. If you practice yoga balancing poses are inevitable. When we first attempt them we discover that balance is not static. As we stand in tree pose (for example) our body oscillates and our muscles make tiny movements. That’s the way bodies are designed to work. Similarly in our lives balance is never a static ‘one and done’. Life conspires to throw things at us that will push us out of balance; and we must remain vigilant so we can make adjustments. At times these will be minor – such as when we notice more and more work-related texts or emails encroaching on the rest of our lives; and we choose to renegotiate our boundaries. At others a major life event – such as the birth of a child or the sudden illness of a family member – will force us to make bigger adjustments. Balance calls for dedicated focus. If you’ve ever attempted a balancing pose in class and noticed your neighbours wobble you’ll know how easy it is to lose concentration and find you’re also starting to wobble. To avoid this yoga teachers often recommend we keep our gaze focused towards a ‘drishti point’. As we do our mind quietens, we connect with ourselves and we find it’s easier to remain balanced. When it comes to balancing your life where is your focus? What is your ‘drishti point’? The more we keep our attention on the balance we want in our lives, the more likely we are to find it. Balance becomes easier the more we practice. Half Moon pose is one of my favourites. 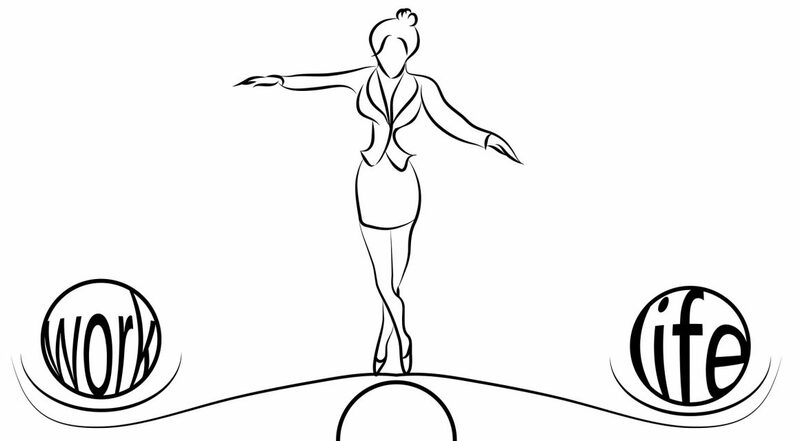 You balance on one arm and one leg while raising the other leg and arm high. Despite a perfect demonstration by my teacher, it seemed almost impossible to me when I first attempted it myself. Gradually, as my body has become stronger and I’ve learnt how to make the necessary adjustments, I’m able to hold the pose for longer periods of time. The same approach applies to finding balance in your life: the more you practice, the more skilled you become and the easier it gets. I’ve experienced yoga as a gentle but powerful way for my body to reach a higher level of well-being. Nowadays many employers offer on-site yoga classes; and if yours is one I would recommend trying it. The healthier your body becomes, the easier it is to maintain a sense of well being and balance. And when the wobbles come and knock you off kilter you will know that simply pausing and breathing can put you in the right frame of mind to make the necessary adjustments.